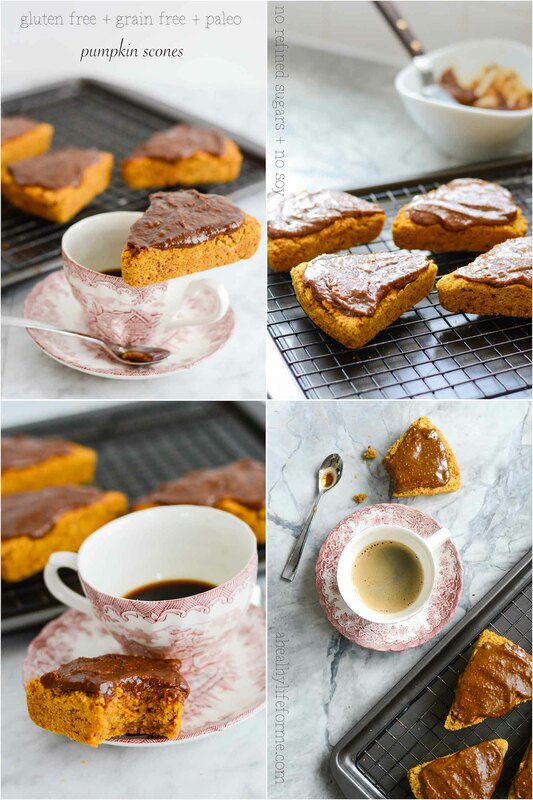 These Gluten Free Pumpkin Scones are perfect to enjoy on a cool morning with a warm cup of coffee or tea. 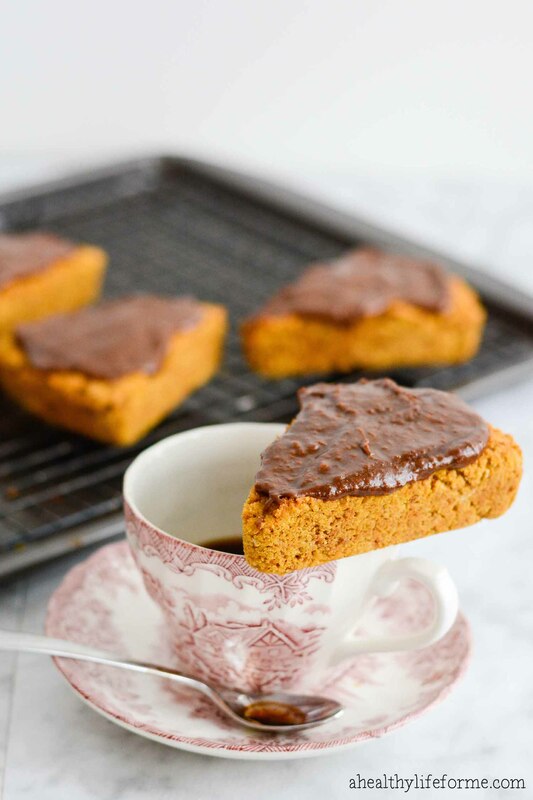 Grain free, gluten-free, soy free and no refined sugars also make these perfect for those on the paleo diet who want a sweet tasting baked good. I am a girl who loves her scones. I am not too picky about the flavor, blueberry, raspberry, pumpkin they all make me HAPPY especially if I can enjoy it with a foamy cappuccino. Being the season of the pumpkin I wanted to whip up a batch of scones and I wanted them to be gluten-free. I was pretty excited with the finish product, excited indeed. These gluten free pumpkin scones are more like traditional rounded scones in both taste and texture. They are not “fluffy” since only gluten can do that, but their taste is amazing and the scones are loaded with the warm pumpkin spice we love. Crispy on the outside and soft, muffin like in the inside. In a medium bowl, whisk together the pumpkin, egg, coconut milk, maple syrup and vanilla. Set aside. In the bowl of a food processor fitted with the blade attachment, combine the flours, baking powder, baking soda, salt and pumpkin spice mix. Process to combine. If using scone pan divide batter evenly and press into compartments. If forming by hand lightly flour a countertop or work surface with coconut flour. Dump the sticky scone dough onto the floured surface and dust the top lightly with more flour. Using your hands, gently knead the dough until it comes together into a smooth ball. Divide the dough in half. Dust your work surface with coconut flour again and form each half into a 5-inch circle, about 3/4-inch thick. Using a sharp knife dusted with flour, slice each circle into 6 even wedges (cut each circle in half, then cut each half into thirds). If the dough starts to stick to the knife, dust the knife with more flour. Place the wedges on the prepared baking sheet. Process Coconut Sugar in Food processor and add all of the ingredients until well combined with no lumps of sugar. When the scones are cool, use a butter knife to spread and swirl the glaze evenly over top. Wait about 15 minutes for the glaze to set before serving. 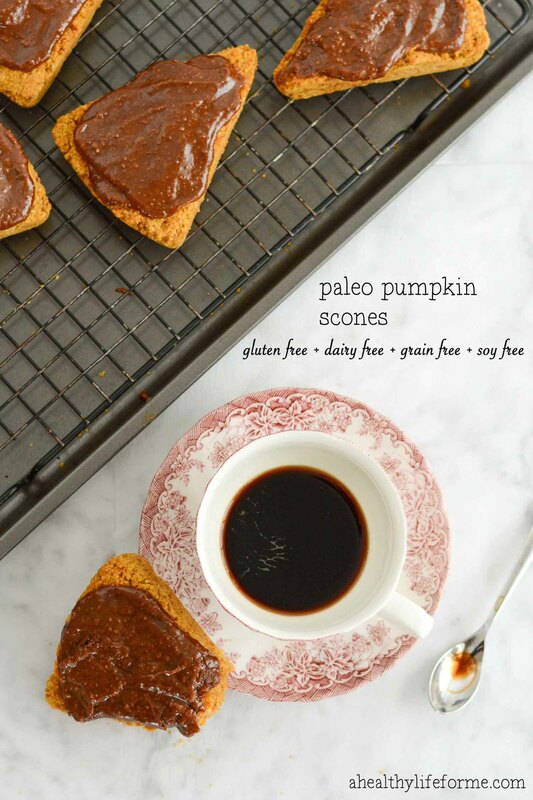 What a great idea to make your scones gluten free. The taste is so much more important than the rise factor and these look delicious! Thanks Betsy. They are delicious. These sound so delicious and I love that they are gluten free. These look so yummy. 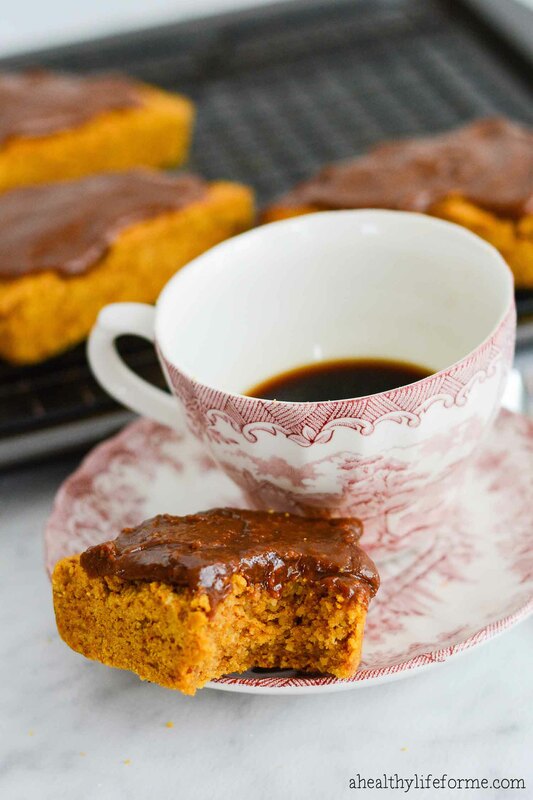 My family has started to transition towards gluten-free life and we will definitely be trying this recipe. Sahily, I hope you enjoy the recipe and good luck with your transition. It is amazing how much better we feel without the gluten. My gluten free scones always turn out dry, I am going to have to give this recipe a try!! Looks great Amy! Mmmm! I love pumpkin scones! Your my kind of girl Carissa. Love those scones. These look great! Passing these along to my friend who’s grain free, gluten free, and dairy free! Thank you Kerri, I hope she enjoys the recipe. These look really good!! Thank you for sharing! Your welcome Courtney, and thanks for stopping by. I hope you do Jamie, they are delicious. Love pumpkin and Im super excited I have all these ingredients on hand. Yey! Thanks Chrysta, I hope you enjoy them. They are yummy! 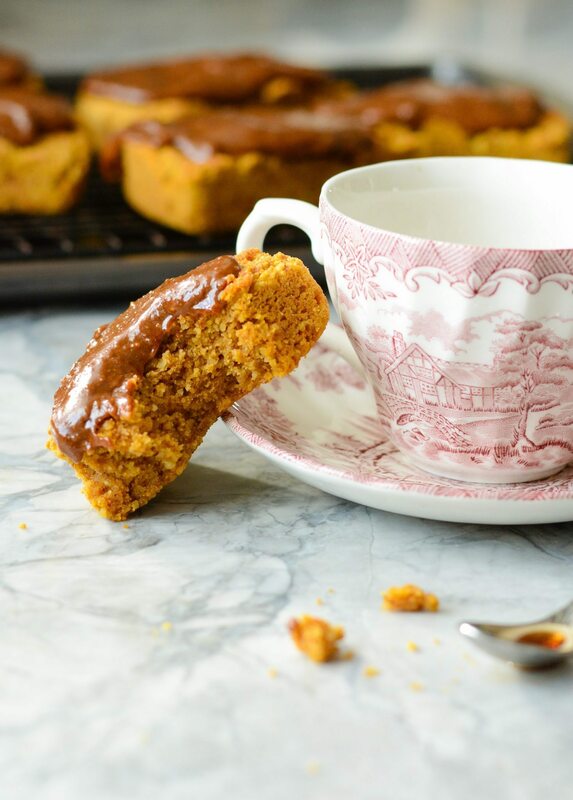 The vibrant colour of these pumpkin scones is just incredible! I definitely need to make these, I am just loving the glaze ontop especially! Dana, Here you go. Sorry that wasn’t showing up. Enjoy!